Control whether users are allowed to create Private Message folders on your board. This plugin came about when I was modifying my forum and ran into errors trying to do a modification. Disable Folders is a simple plugin that disables the Folders option for your end users. When a user tries to access the Folders panel, they will run into a friendly message informing them that "The Creation of Folders has been disabled by the Board Administrator". Please note that this plugin does NOT remove the folders link in your Navigation templates. You must remove that yourself. It also does NOT disallow access to existing folders. Disable Folders also inserts one setting, located in the "Private Messages" setting group. It does not modify any templates and comes with it's own language file (with only one line). In the future I plan to move the entire plugin (including Admin CP strings) to language files. 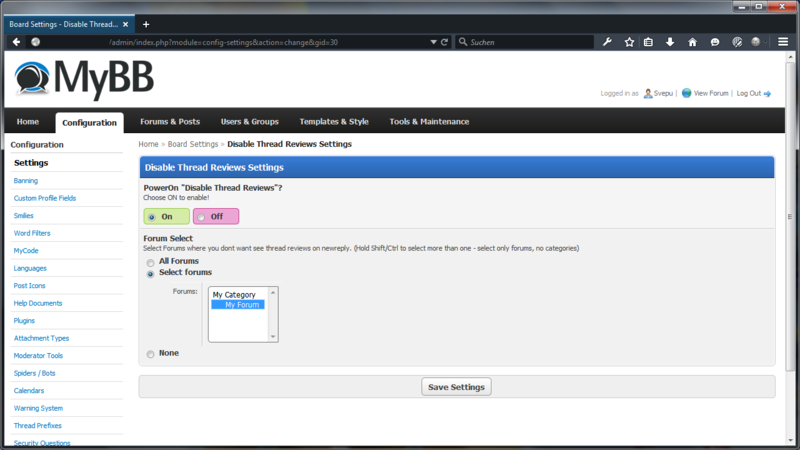 MyBB 1.8 plugin to disable thread reviews in certain forums while writing replies. Disables showteam.php to make it more difficult to find a list of powerful accounts and reduces the potential attack surface of MyBB.